The Philippines is made up of 7,107 islands covering a land area of 115,739 square miles. The main island groups are Luzon, Mindoro, the Visayas, Palawan and Mindanao. The country’s capital is Manila, in Luzon. The Philippines is part of the “Coral Triangle”, the most biologically diverse underwater ecosystem on earth. Exceptional diving can be found in and around Puerto Galera (on the island of Mindoro), Dumaguete (on Negros Oriental in the Visayas), Boracay (the Visayas) and Anilao (Southern Luzon). The Ninoy Aquino International Airport (NAIA) in Manila is the premier gateway. The international airport and domestic airport are located in separate terminals. Cebu Mactan International Airport is another means of entering the country. 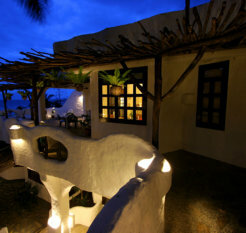 It is located in the Visayas, closer to Boracay and Dumaguete. The two official languages are Filipino and English. Filipino, which is based on Tagalog, is the national language. English is also widely used and is the medium of instruction in higher education. The Philippines’ monetary unit is the Peso. Foreign currency may be exchanged at any hotel, most large department stores, banks, and authorized money changing shops accredited by the Central Bank of the Philippines. International credit cards such as Visa, Diners Club, Master Card, and American Express are widely accepted. The time zone of the Philippines is GMT +8 hours. The time difference is as follows: Los Angeles and San Francisco (+16 hours), New York (+13 hours), Chicago (+12 hours). Local dives are scheduled for 9am, 11am, 2pm, 4pm and 6pm. Night dives are available every day. The choice of dive sites is up to you! Dive groups are limited to six people. Most dive sites are within ten minutes of the resort. Day trips to Verde Island and the Hot Springs of Chicken Feather Island may also be arranged. Come enjoy one of the few destinations in the world that combines unbelievable muck diving with pristine coral reefs and shoals of schooling fish…..
Local dives are scheduled for 9am, 11am, 2pm, 4pm and 6pm. Night dives are available every day. The choice of dive sites is up to you! Dive groups are limited to six people. Most dive sites are within ten minutes of the resort. Day trips to the islands of Apo, Balicasag, Siquijor and Sumilon may also be arranged. Come enjoy one of the few destinations in the world that combines unbelievable muck diving with pristine coral reefs and shoals of schooling fish…..
At Atmosphere Resort, you can take full advantage of some of the world’s best diving. The world renowned Apo Island with its walls, stunning coral and schooling fish is a short boat ride away. Some of the world’s rarest critters compete for the underwater photographer’s attention along the Dauin coastline where Atmosphere is situated. At the heart of the resort lies a state of the art dive centre. As a PADI 5 Star Instructor Development Center, Atmosphere Dive meets the demand for spacious wet facilities and increasing technological support. With this in mind, guests enjoy private dive equipment storage spaces, a camera/video room with private work space for each diver, wireless internet, nitrox, a retail boutique, full equipment rental and a spacious briefing area. Atmosphere Dive has two purpose built dive boats. Victoria is a beautiful 84 foot long, local banka boat, used mainly for day trips to outlying islands. Eve is a 30 foot long speedboat, used to transport divers to the Dauin marine sanctuary dive sites, all of which are within 15 minutes of the resort. Fresh fruits, drinks and face towels are standard and if you desire your own private dive guide or boat, it can easily be arranged. The Amun Ini dive shop has a large equipment room with lots of gear to rent, as well as a lot of room for you to hang your own personal gear. At the end of each dive day your gear will be cleaned and hung up to dry so it’s ready to use again the next morning. A 30-foot speedboat contains a first aid kit and emergency oxygen at all times. You’ll be offered a wide array of drinks and fruit to snack on between dives. Nitrox & night dives are also available. Anda, Bohol is home to one of the healthiest reefs in the Philippines. Anda contains 20 dive sites, each one unique & healthy. All dives are guided by experienced and knowledgeable dive masters or instructors. High voltage drift dive through deep canyons teeming with sweetlips, trevallies, drums, batfish and big sea fans. Kneel on the sandy bottom next to a sheltering canyon wall to take in the jacks, barracuda and snapper in the current above your head. This will also give you time to search the canyon for sea snakes, octopus and scorpionfish. Manta rays, thresher sharks and hammerhead sharks have all been spotted here as well. Nudibranch heaven! Hundreds of colorful nudibranchs representing 15 different species and countless sea cucumbers join leaf fish, harlequin sweetlips, warty frogfish, crocodile fish and almost every kind of anemone fish there is! Lionfish and cuttlefish are also attracted to the sponges and green tree coral that cover the wall. A short, wide swim-through at 36 ft through a wall covered with soft coral attracts schools of drummers, sweetlips, trevallies and snapper, as well as octopus, frogfish, turtles and sea snakes. Watch out for lionfish, scorpionfish and hydroids as you swim through! The other side of the wall is covered in soft coral, sponges, green tree coral and fans and is a popular hangout for morays and puffers. 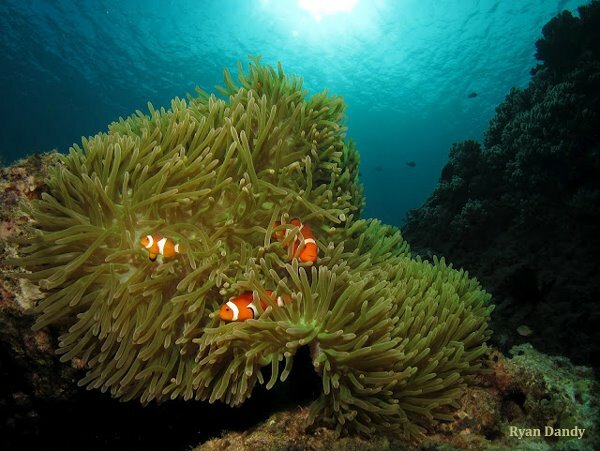 A small wall with a very healthy reef is home to colonies of anemone fish, clownfish, scorpionfish, schools of longfin bannerfish, sweetlips, cardinal fish, triggerfish, and lionfish. Also enjoy a large variety of nudibranchs, as well as moray and blue ribbon eels. A sandy channel complete with big sea fans between two coral hills usually houses frogfish, octopus and schools of snapper. Known for it’s fantastic diversity of fish and corals, this dive site consists of flat areas broken up by ridges at all depths. Schools of anthius, surgeonfish, angel fish, butterfly fish, parrotfish and many other reef fishes join morays, frogfish, banded sea snakes, turtles and octopus. Other visitors include a school of batfish, a large school of longnose emperor fish, red tooth triggerfish and pygmy seahorses. Great critter dive plus the remains of a Japanese fighter plane nearby! Large sandy areas provide the opportunity to see skeleton shrimp, demon stingers hiding in the sand and juvenile frogfish. Undulating fields of pink coral hide nudibranchs and mantis shrimp. A plethora of pufferfish, snake eels, surgeonfish and stargazers allow you the chance to get up close and personal. Turtles are also prevalent here. Originally a Filipino cargo vessel, the Alma Jane was sunk in 2003 and is now a perfect artificial reef standing upright on the sandy bottom. Sweetlips, batfish, rabbit fish, scorpionfish, and pufferfish surround the hull, while lionfish, trumpet fish, frogfish, snapper and a variety of shrimp await discovery as you swim through the wreck. Coral heads, giant plate corals, staghorn corals and barrel sponges surround soft corals teeming with anthius, parrotfish, large schools of sergeant majors, damsel fish, butterfly fish and angel fish. Careful observation will also reveal gobies, lizard fish, shrimps, scorpionfish, juvenile lionfish and grouper. This is also a great site for snorkelers! A beautiful reef covered with stony hard corals slopes off to a sandy bottom. Schooling anthius, butterfly fish and sergeant majors are everywhere as you drift into the channel past small walls covered with potato coral, purple gorgonia and green tree corals. In the channel, you’ll encounter large barrel sponges, commensal shrimp on long whip corals, fire urchins and mushroom corals. You’ll also spot nudibranchs, mantis shrimp, cuttlefish, lionfish, scorpionfish and giant frogfish. Just steps from your room you’ll discover sea grass and coral beds hiding a number of rare creatures. Colorful mandarin fish, lionfish, scorpionfish, nudibranchs, schools of catfish and yellow tail snapper, freckled porcupine fish, morays, blue spotted stingrays, ringed pipefish, crocodile fish and juvenile batfish are common sightings. Also keep a close eye out for devilfish, ghost pipefish, frogfish, ribbon eels, twin spotted gobies, double spotted lionfish, comet fish, blue ringed octopus and spanish dancers. An amazing variety of reef fish and interesting critters can be found here! Enjoy peacock groupers, red snapper, batfish, sweetlips, blue-spotted stingrays and schools of jacks and fusiliers. Some of the smaller creatures you’ll encounter include morays, scorpionfish, cowries, mantis shrimp, crab-eye gobies and nudibranchs galore! The stunning soft corals on this pier are surpassed only by the incredible diversity of marine life that can be found here. Multiple species of morays and frogfish, cuttlefish, scorpionfish, devilfish, pipefish, batfish, seahorses and juvenile trevallies are regular sightings. Also possible are octopus, stonefish, harlequin ghost pipefish, flamboyant cuttlefish, harlequin shrimp and juvenile batfish. Immense schools of hundreds of jacks are the main focus here. You’ll also see banded sea snakes, turtles, 4 varieties of snapper, boxfish, clown triggerfish, scribbled filefish, pyramid butterflyfish and longfinned bannerfish. Also look for napolean wrasses, tuna, cuttlefish, bumphead parrotfish, batfish, eagle rays, mantis shrimp, blue spotted stingrays, flatworms and frogfish. A landscape that is representative of the volcanic origin of the island provides interesting terrain for plenty of critters! Coral bommies, black sand erupting with bubbles from geothermal activity below, ledges with deep undercuts, a wall and a soft coral garden reveal nudibranchs, frogfish, flatworms, scorpionfish and blue ribbon eels. A large reef protruding into open sea currents ensures incredible marine life…Big schools of red tooth triggerfish, pyramid butterflyfish, longfin bannerfish, fusiliers, unicornfish, black-and-white snapper, blue fin trevallies, potato groupers and nudibranchs. If you’re lucky, you may also see remoras, turtles, sea snakes, batfish, morays, frogfish and mantas. A gentle slope with excellent hard and soft corals meets a wall with plenty of cracks and caves to explore. Lionfish, morays, batfish, soldierfish, nudibranchs, sweetlips, groupers, surgeonfish, fusiliers, snapper and anemone fish abound. Occasional visitors include turtles, Napolean wrasses, schools of jacks, frogfish and barracuda. This is a fantastically populated wall that is suitable for all diver levels. Advanced divers can drop down to 65-100 ft to look for seahorses. The top of the wall features amazingly bright corals and a huge variety of marine life. Schools of jacks and fusiliers are common. This is a great snorkeling spot as well. This attractive, steep wall is populated by Sergeant Majors, nudibranchs, barracuda and much more. There is a wide cave at 88 ft.
Another attractive, steep wall, this one fed by the main current. A wide variety of flora and fauna can be seen here, with a chance of big fish in the open water. This relatively shallow dive is suitable as the second dive of the day. The nicely populated steep wall offers up barracuda, humphead parrotfish, lion-fish, nudibranchs, sea spiders, huge flatworms and more. Lots of nooks, crannies & crevices to explore! Don’t miss diving at dusk with the Mandarinfish! Located 70 miles south of Manila on the island of Mindoro, Atlantis Puerto Galera places you within 10 minutes of thirty-five world class dive sites. 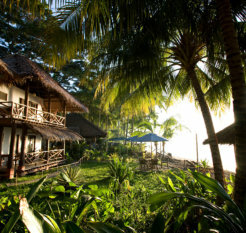 Beautifully built into the hills of Sabang Beach, the resort enjoys a beachfront location. 40 guest rooms & suites are designed for maximum comfort, privacy and relaxation. All rooms feature a/c, fully-stocked mini bar & refrigerator, supply of emergency toiletries, adjustable ceiling fans, ensuite facilities with solar heated hot water, cable TV with free movie & sports channels, in-room safety deposit box and free wireless internet. Choose between a Deluxe Double Room (right) with a double bed and a terrace or patio or a Deluxe Twin Room (above) with a double plus single configuration and a terrace or patio. Also available are the Seaview Terrace Room & Coconut Terrace Room. These each have 2 reduced double beds and coffee/tea making facilities. The Seaview Terrace Room has a large private seaview balcony. The Coconut Terrace Room has a large private poolside terrace. The Flintstone Family Suite (left) is a large room next to the pool with a double bed plus 2 bunk beds. Also available are 2 Flintstone Family Seaview Suites, each with a king bed & 2 bunks, plus a private seaview balcony, DVD player & coffee/tea making facilities. The resort also offers an Executive Suite and a Honeymoon Suite. Each of these suites has one king bed plus a living area, DVD player, coffee/tea making facilities & spacious seaview balcony. Toko’s Restaurant has become synonymous with fine dining. Using fresh local products and flavors while adhering to an international standard, Toko’s has moved away from monotonous a la carte menus to daily changing blackboard lunch & dinner menus, theme nights and a lunchtime Mongolian Wok. Choose from an extensive list of cocktails and shakes or enjoy the best coffee in town. Enjoy a range of therapeutic and relaxing massage & spa services…the perfect way to unwind from a hard day’s diving and add the finishing touches to your vacation. Atlantis Dumaguete is located on a long peaceful stretch of beach on the island of Negros Oriental, a short sixty minute flight from Manila. In addition to the dive sites located directly in front of the resort, you’ll enjoy easy access to the world famous islands of Apo, Siquijor and Balicasag. Forty elegantly designed guest rooms and suites offer maximum comfort, privacy & relaxation throughout your stay. All rooms feature a/c, fully stocked mini bar & refrigerator, supply of emergency toiletries, adjustable ceiling fans, ensuite facilities with solar heated hot water, cable TV with free movie & sports channels, in-room safety deposit box, free wireless internet access, and a private patio or balcony with hammock. Deluxe Rooms (above) feature a double bed that can be converted into two twin beds. Some Deluxe Rooms (right) have an adjoining room with 2 twin beds, making them perfect for families. Oceanfront Rooms offer a direct ocean view plus DVD player and coffee/tea making facilities. Garden Suites offer one double bed plus a large furnished balcony, DVD player & coffee/tea making facilities. There is also a Seaview Suite that has one queen bed plus DVD player, coffee/tea making facilities, a small office with desk & a large balcony. Also available is a Deluxe Garden Suite with king size bed, separate living area, private garden, 2 flat screen TVs with DVD players & coffee/tea making facilities. Toko’s Restaurant, right on the beach, provides a unique dining experience. Using fresh local products & flavors, while adhering to an international standard, Toko’s has moved away from monotonous a la carte menus to daily changing blackboard lunch & dinner menus. Choose from an extensive list of cocktails & shakes or enjoy the best coffee in town. The spa features four private therapy rooms and a sauna & rain shower area. Unwind from a hard day’s diving and add the perfect finishing touches to your vacation. Indulge yourself and surrender to Atmosphere, where the warmest of Philippine hospitality combines with luxury amenities & first class service for an unforgettable experience within the stunning Philippine archipelago. Beautifully situated within an old seven acre coconut plantation on the island of Negros Oriental, the resort enjoys a spectacular beachfront location alongside the warm coastal waters of the Philippine Sea. Whether you want to scuba dive, indulge in the enchanted spa or simply read a book by the pool, you can look forward to an unforgettable stay. Nestled discreetly within the lush tropical gardens is a mixture of suites, garden apartments and penthouses, making relaxation and reflection a must. The resort combines a serene tropical landscape, modern design and some of the best hospitality in Asia. All rooms feature California King beds, exotic tropical fruit, eco-friendly cosmetics, coffee & tea making facilities, energy efficient a/c, flat screen tv’s, wireless internet, minibar, dvd-players, rain showers and luxury turn down service with a surprise. 14 Suites look out over the lush green lawn and tropical gardens to The Sanctuary Spa beyond. With the sound of running water vivid from each hammock or day bed, relaxation is a must. A desk, widescreen tv with dvd-player and wireless internet will keep you connected or you can disconnect and submerse yourself in the rain shower within the natural surroundings of your own private outside pocket garden. Each suite has a California King as standard but twin share is also an option. A third bed can be made up for an extra fee, allowing for triple occupancy. 8 Garden Apartments are the perfect choice for you if you prefer the luxury of a spacious lounge with a dining area and a fully fitted kichen. Sliding doors take you seamlessly out onto the veranda with its outdoor dining area and seated hammock. he Garden Apartment bathroom is pictured right. A master bedroom with a floor to ceiling picture window looks into your own private pocket garden. The Garden Apartments fit 2 guests comfortably. The 4 Penthouses are Atmosphere’s flagship and most luxurious type of accommodation. The spacious units consist of a master bedroom and guest bedroom, 2 modern en-suite bathrooms and an open plan fully-fitted kitchen overlooking a huge living and dining area. The vast external balcony has room for eating and lounging outside whilst still in the comfort of your elevated penthouse. The penthouse fits four people in two separate bedrooms. 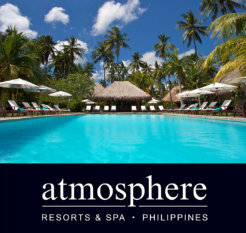 At Atmosphere Resort, the utmost importance is placed on the quality of the food and beverage experience provided. The aim is to create a flexible approach to dining which can cater to all of your culinary needs. Whether you wish for a romantic dinner on the beach, a seafood barbeque, eating in “Blue”, the signature fine dining restaurant, or simply relaxing at the bar, the choice is yours. When the doors to The Sanctuary Spa open, a secret garden is unveiled where four treatment pavilions nestle discreetly amongst running waterfalls, ponds and tropical plants. Each pavilion has two treatment tables and its own unique bathroom. Also present in the spa is a heated pool for Watsu (water shiatsu) treatments. The central Shala is The Sanctuary’s relaxation and reception area where you can recline and read a book to escape the mid-day sun. The spa offers a multitude of treatments and wellness packages, ranging from massages, facials and body wraps to water therapy, yoga and relaxation classes. Amun Ini Beach Resort & Spa is set on 7 acres in the municipality of Anda, Bohol province in the Philippines. The resort was strategically placed to provide a breathtaking view of (and easy access to) a crystal clear blue sea and white sand private beach. The waters around Amun Ini boast a 9 mile long coral reef, offering endless attractions for snorkeling and diving enthusiasts. Amun Ini features 16 spacious rooms designed in contemporary Filipino style. Each room has its own private pebble-floored balcony that offers breathtaking views of the Bohol sea and lush tropical gardens. Every room has a flat screen TV, mini-bar, cable and internet service, and a bathroom with modern fixtures and a pocket garden. Amun Ini’s restaurant allows you to immerse yourself in gastronomic sensations with gourmet delights created by top class chefs. Using family recipes and ingredients that are locally sourced and sustainable, the chefs have designed a menu that is second to none. A stay at Amun Ini Beach Resort & Spa would be incomplete without indulging your body with a visit to the Hilotarium Spa. The Spa’s therapy concept is based on the ancient Filipino method known as ‘hilot’ that combines aromatherapy & massage for a holistic experience. Spa therapy sessions are available on the beach, in your room or surrounded by the tropical landscape in the spa pavilion. This charming grill right on the water offers a tropical ambiance, a great view and a simple, but delicious menu. Located in Sabang. Great pasta! Located in Sabang. If you’re craving curry, head to this popular Sabang restaurant. Located at El Galleon Beach Resort in Small LaLaguna, The Galley boasts an amazing beachfront view and excellent European and Filipino cuisine. This bistro/deli is open for breakfast, lunch, dinner and late-night cocktails & snacks. Located in the Boat Station 1 area, Jonah’s has the best fruit shakes on the island. The mango shake is not to be missed. Enjoy a beachfront table on the sand beneath the palms. A varied menu offers grilled seafood, pizza, crepes and more. Excellent pasta and thin crust pizza near Boat Station 3. Quick & tasty Mexican. Great tropical drinks! Between Boat Stations 1 & 2. 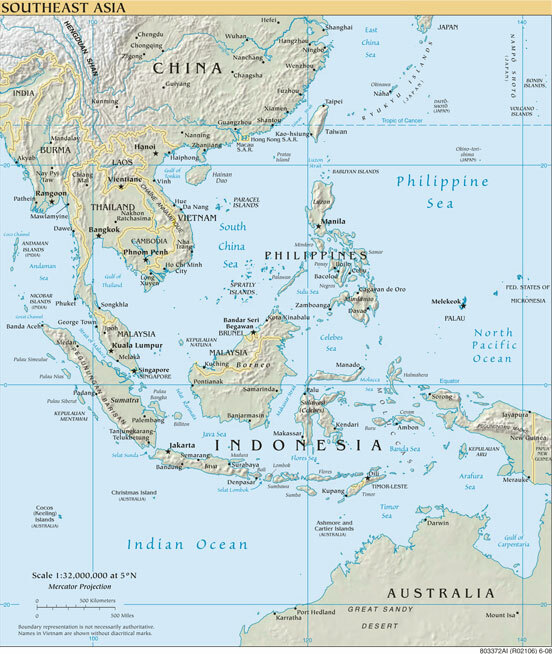 The Philippines is an archipelago located in Southeast Asia between the Philippine Sea and the South China Sea. 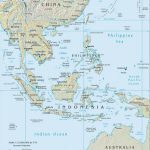 It is east of Vietnam, south of Taiwan and north of Borneo. It consists of 3 main islands groups, Luzon at the north, Visayas at the center, and Mindanao at the South. Where is Puerto Galera, Philippines? It is located on the northeastern tip of the island of Mindoro Oriental, which is south of Manila. It is a 3 to 3 and a half hour drive from Manila International Airport to the Batangas Pier where you take a 45 minute boat ride to Puerto Galera. It is located on the southeastern tip of the island of Negros Oriental in the Visayas. It is an hour and 15 minute domestic plane ride from Manila. It is located on the northern tip of Panay Island, south of Mindoro Island in the Visayas. It is a one hour domestic plane ride from Manila. It will all depend on the airline you are using. From Los Angeles, it can take about 16 hours and 20 minutes to get to Manila. There are also direct flights to Manila that can cut your travel to about 12-13 hours. The unit of currency is the Philippine peso. Major credit cards like Visa, Mastercard, Diners Club, and American Express are generally accepted in major establishments. Foreign currency may be exchanged at any hotel, most large department stores, banks, and authorized money changing shops accredited by the Central Bank of the Philippines. The exchange can float between $1.00 = Php 42.00 – 45.00. The national language is Tagalog and is spoken all over the Philippines. English is the second language and is also spoken nationwide. Yes. Passport should be valid for at least 6 months. U.S. passport holders may enter the Philippines and stay for 21 days without a visa. Citizens of other countries are advised to contact the nearest Philippines Consulate for information on entry formalities. If you wish to extend your stay while in Puerto Galera, this can easily be done for US$60.00 for an extra 38 day period. 220V. It is advised that you carry your own converter/adaptor. Visitors are allowed to bring 2 checked bags at a maximum of 70 pounds each and 1 carry on of 20 pounds. The following are allowed duty-free: reasonable quantity of clothes, jewelry, and toiletries, 2 cartons of cigarettes (400 sticks of cigarettes in total) or 2 tins of tobacco, 2 bottles of wine or spirits of not more than 1 liter each. What airlines fly to the Philippines? Cathay Pacific, Singapore Airlines, Philippines Airlines and others offer full jet service the entire way. The international flights are on 747’s. Domestic flights within the Philippines are on 737’s. What are the seating configurations? The 747’s have a 3-6-3 configuration. The 737’s have a 3-3 configuration. Puerto Galera El Galleon Dive Resort arranges a private pickup or can assist you on your public transfers. Atlantis Puerto Galera meets you and directs you to the van that will provide your transfer to Puerto Galera. Atlantis Dumaguete requires you to transfer from the international airport in Manila to the domestic airport to connect to your flight to Dumaguete. If you are flying Philippines Airlines all the way to Dumaguete, it has it’s own terminal and airport personnel will direct you to your domestic connecting flight. However, if you are coming in on other airlines, an Atlantis staff member will meet you and direct you to your transfer to the domestic airport for your connecting flight. Pinjalo Villas and Calypso Divers can arrange boat transfers from the domestic airport. Diving is all year round. Water temperature is between 22-24 C (72-75 F) during the months of December-February and 25-29 C (77-84 F) between March and November. Puerto Galera – wrecks, drops, slopes, walls, caves, critters, nudibranchs, corals. Dumaguete – coral gardens, drop offs, walls, coral mounds, pelagic, muck diving. Diving in Apo Island requires care during the full moon as the current can be strong and unpredictable. Boracay – sign up for a Dive Safari for encounters with mantas and eagle rays, grey reefs and white tip sharks, and wall diving of soft and hard corals. The rest of the dives in Boracay offer pelagics, soft, stony, and table corals, gorgonians, walls, and slope dives for beginners and novices. The water will be in the mid 70’s or low 80’s. We recommend a full 3 mm. However, divers that are used to cold weather and waters dive in a 3 mm shorty, or in their bathing suits with a rash guard. Boat rides are on the Filipino outrigger boats called the “Bangka”. These are motorized boats with 2 lateral supports called outriggers extending from each side. They can hold between 8 and 12 people. Puerto Galera – It takes about 15 minutes of boat travel to get to the dive sites. A day trip to Verde Island takes about 45 minutes. Dumaguete – Most of the dive sites are a 10 minute boat ride away. A trip to Apo Island will take 45 minutes. A trip to Balicasag will take 2 hours. Boracay – Dive sites can be between 10 minutes to an hour away. Puerto Galera – Local dives start at 9am, 11am, 2pm, and 4pm. Optional night dive is available for extra charge. For Verde Island, it’s 3 dives for the day. Dumaguete – Local dives start at 9am, 11am, 2pm, and 4pm. Optional night dive is available for extra charge. For Apo Island, it’s 3 dives for the day. Trips to Balicasag can be arranged at the resort. Boracay – First dive starts between 8 and 9:30am. You then dive all day until 3-4pm. Most dive sites are 10-15 minutes away. Night dives are also offered and can be arranged at the resort. Airport terminal fees: For international travel, it is Php 550.00 (US$13.00). For domestic travel, Php 200.00 (US$5.00). Payable only in Philippine pesos.